SEMENYIH (Nov 4): Pay only 20% of the total house price to own your dream home – it might sound too good to be true, but it is true. 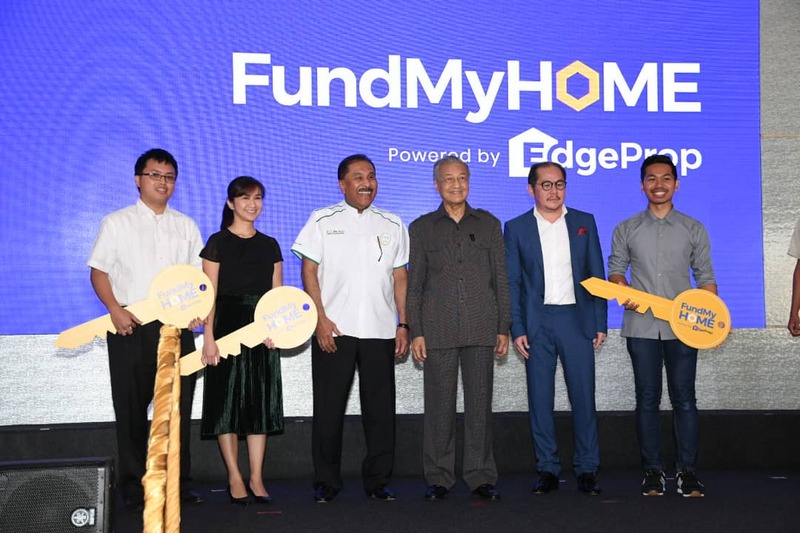 This is made possible with the FundMyHome (FMH) innovative homeownership scheme and the FundMyHome.com platform developed by EdgeProp Sdn Bhd which were launched by Prime Minister Tun Dr Mahathir Mohamad today. In a nutshell, FundMyHome allows a person to acquire a selected property for 20% of the price of the property, while the balance 80% will be contributed by institutions who are interested to fund the acquisition in exchange for the potential appreciation in value of the home. There could be no need for financing if the buyer is able to fork out the 20% payment on his or her own, thus allowing them to avoid having to bear a heavy financial burden over decades. Dr Mahathir presented the first three homebuyers under FundMyHome the mock keys to their new homes, all located at Eco Majestic's Harmoni Apartments in Semenyih, at the launch today. One of the homebuyers using the FundMyHome Iyliasani platform Ahmad Kamal Shukri could not believe such a scheme exists when he first heard about it from his family. The 24-year-old engineer is currently staying with his parents in Kajang. “My parents have four kids and I’m the third child. My two older siblings have already bought their own homes,” he shared. “My friends and I always talk about buying a home, but we don’t see how we can afford to do so, especially to get a loan,” he added. But now lyliasani can tell his friends that he owns a home in Semenyih under FundMyHome after having started working for just one year. “My parents helped me with the 20% payment to purchase the home in Semenyih, which is near their home now. I’m not immediately sure if I will be staying in the new house but that is a place that I can call my own,” he said. Another homebuyer under FundMyHome is Abdul Fattah Ahmad, who also shared the joy of owning his first home. When he first heard of the “attractive proposal”, he was stunned by the “no mortgage needed” concept. The 29-year-old who has been working as an executive in the financial sector for three years has little discretionary income to afford a mortgage. “I am now living with my family and I have been thinking of buying a house since my university days. To fulfil my dream, I have been saving for a downpayment for my home purchase,” he told EdgeProp.my. “However, my wages have remained stagnant in the past three years while the cost of living and house prices have both gone up. And even if I have saved up enough money to pay the downpayment, it is very difficult for me to repay the loan,” he said. He cited that a regular apartment today could easily have a price tag of about RM300,000, which would require the buyer to repay about RM1,400 a month under a 30-year loan with about 4.5% of interest rates. Then Abdul Fattah discovered FundMyHome. “This is an attractive proposal and when I first heard about it, I was stunned because there is no need for mortgages! This scheme is certainly not conventional and I’m very excited to finally own my dream home with the 20% payment that my family assisted me with,” he said. Unlike lyliasani and Abdul Fattah, Aileen Ooi never thought of owning a home as she was deterred by the high property prices, until she heard about FundMyHome. “My husband and I could not find the right product. We were also bothered by the monthly payments,” said the 32-year-old when contacted. Aileen who is an air stewardess could not be present at the event but was represented by her sister Joanna. “So when we heard about FundMyHome, we thought it was too good to be true. It is very innovative and we were attracted by the no monthly repayment feature,” she added. With FundMyHome, Aileen finally set her foot on the housing ladder as a first-time homebuyer. For a start, FundMyHome is offering about 1,000 units of homes priced up to RM500,000 provided by nine established developers, namely Eco World Development Group Bhd, IJM Land Bhd, IOI Properties Group Bhd, Mah Sing Group Bhd, Selangor State Development Corp (PKNS), PNB Development Sdn Bhd, Sunway Bhd, Trinity Group Sdn Bhd and UEM Sunrise Bhd. Maybank Group and CIMB are the institutions contributing to the 80% portion of the home price.